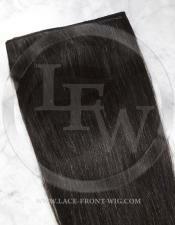 Introducing Sewn In Hair Weaves by Lace Front Wig available in the multiple colors and various types of textures. 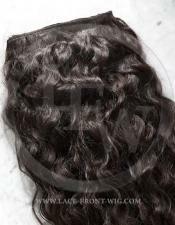 The hair weave textures we supply include straight, bodywave, and curly. Our black hair weave styles are made with 100% Indian remy human hair and are extremely affordable as compared to buying from a beauty supply store! Please make sure to read our blog post on frequently asked questions about sewn in hair weaves hairstyles. What are Hair Weaves? How Can They Benefit Me? Sew In Hair Weaves are a great option for black women and allow you to change your hairstyle in an instant. The hair weaves we offer are made of human hair with track attachments which are woven into your existing hair. The concept of black style weaves has evolved over the decades, and is becoming more popular among the average individual looking to spice up their current hairstyle. Aside from their beautiful look, hair weaves can instantly add great volume to existing hair and successfully conceal thinning hair as well. Take a look a the photo below to see how to apply the hair weave using tracks. 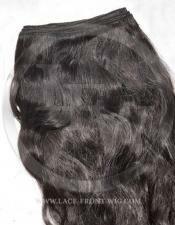 We offer only the best quality black hair weaves at the lowest possible prices. How Long Does A Hair Weave Take To Sew In And How Long Will My Weave Last? A hair weave can either be sewn or glued into the existing hair. The sewing process generally takes from 1 to 4 hours depending on how much hair you decide to have sewn in to you existing hair. With the practice of proper application and maintenance, glue in hair weaves can last up to three weeks; while sewn in weaves last up to 6 weeks. No matter what kind of weave style you're going for, a professional application of a hair weave that is applied by a hair stylist can instantly provide the look you're searching for. You can get the exact style you want and have it tomorrow. You choose the weave texture, hair type, color and length. We can custom make a sewn in hair weave for you. We have been designing and selling quality hair weave products for over 25 years. We offer only the best quality human hair and workmanship available. Our experienced hair specialists are happy to assist you by phone. You can watch our How To Apply Sewn In Hair Weave Videos available on YouTube. To learn more about weaves, please visit our hair weave articles. Questions & Answers about human hair weaves you should know about! Why is a human hair weave right for me? Many clients of ours always wonder what type of hair extension is best for fuller and thicker hair. 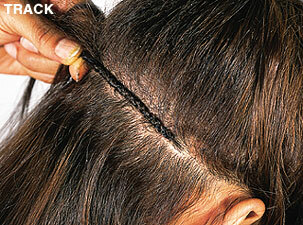 To sum it up, the sewn in human hair weave is the most popular type of hair extension method for black women. Many African American wear these types of weaves because it provides a long lasting hold by the method of which it is applied. The maintenance and removal can be harsh to natural hair if a hair stylist doesn't apply the weave correctly. Can sewn in hair weaves damage my natural hair? Simply put - Yes, these types of hair weaves can damage you current natural hair if not applied correctly. Did you know most African American women whom suffer from hair loss are usually diagnosed with a condition known as Tension Alopecia. This condition occurs when excessive stress to hair root is endured over prolonged periods of time. To prevent such problems, it's important to give your hair a break every once and while and remove those hair weaves that can be damaging to your natural hair.